This has been one of my all time favorites. It is very simple to prepare yet so very tasty. It was the perfect accompaniment to our Saturday-evening tea. Mix everything in water to form a thick batter that coats each slice really well. Heat the oil for frying. Drain off the excess oil on paper towels. Ahaar who is hosting JFI: Banana. This is also my entry for “What’s your favorite snack?” - an event being hosted by Hima of SnackORama. I had some batter left over after making the plantain fritters, so I went ahead and made some onion bhajjis too. I just peeled and halved an onion and used a mandoline to get thin slices from each half, mixed it into the batter and fried it till golden brown. Note: I would normally use chickpea flour (besan) to make the batter for this kind of pakoda, and spice it up with some green chillies or chilli powder. My version is little different..very good pic..
stacked so beautifully :). love that perfect brown colour. This is one of my favs. Used to have it in my childhood. Wish to have a bite right now. Beautiful picture. These look fantastic! I love plantains!! Seena, thanks:-). I am waiting to see your version. Sirisha, it was really good & it can be made quickly. Do try it out sometime. Laavanya, I do too.It reminds me a lot of our once in a year trips to Kerala. We always had this from the same little place on the side of the road on the way to my dad's ancestral home.Those were good times. Asha, great minds DOthink alike! ;-). Waiting to see your version. Padma, I gather there are a few here who plan to make this. It would be interesting to see the different versions. Sreelu, yeah... "deep fried love" as Manisha calls it. It was so good. Fried ice cream? girl, you watch too much of that Paula Deen show!Isn't it bad enough that the banana's fried? I just want to bite into one of those deliciously brown fritters. Such a nice preparation TBC! !I have tasted once with nenthrampazham! Great entry for the event! Yummy!! 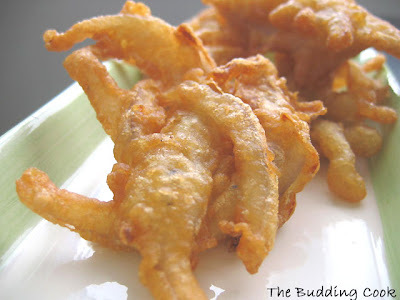 We also make something with ripe nendrams... but I think its more a marinated thing than a batter fried thing. That was me wiping the drool!! Beautiful picture!! !Easy recipe to make. Thanks for sharing. Cynthia, don't you make something very similar too?I think I saw something on your blog a long time back. Raaga, how do u make it. Would like to hear your version too. TBC, good luck with the 2nd attempt of rava dosas... ensure that the pan is hot enough when you pour the batter... :) Let me know. Love this recipe! I need to try it sometime, we have something here that is similar, but it takes fine breadcrumbs, this one of yours must be sooo good! wow, ek teer se do shikaar:) nice one...I think I'll enjoy this banana dish...sounds simple enough, so will def give it a try! Mansi, yeah... so many events going around but not enough time. Do let me know how you like it. You need the ripest plantains u can find. Hey How did i miss this entry. Viji,thnaks :-)Yes... that's why I hardly ever make anything fried. 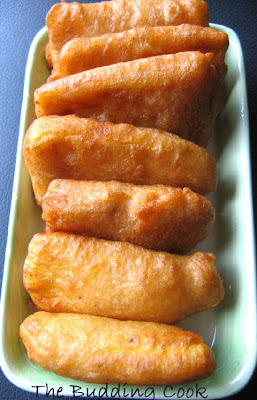 plantain fritters are my all time favorites.they goes lovely with onion ,lemon,salt and red chilly powder stuffung!! !oh my!! !i am imagining that i am tasting them!!!!! Rachna, I like it a lot too. But I make this very rarely. Shella, thank you for the compliment. You are always very perfect. Picture tells how tasty it would be. Seec, thank you, dear:-)You are so sweet!